GRACE bracelet is both beautiful and earth-friendly! 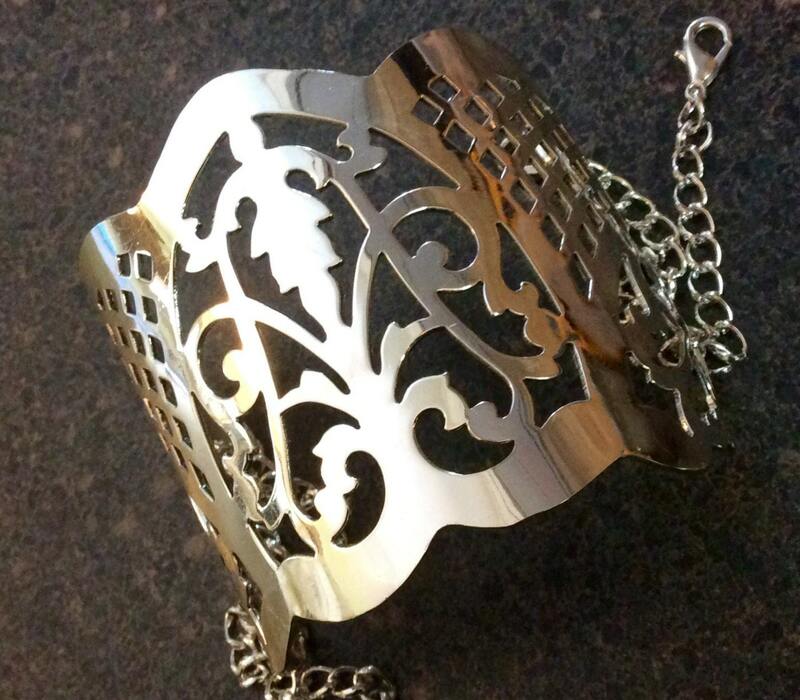 This damask arm bracelet cuff has been carefully created from a vintage silver plate server / tray. This bracelet has been previously loved and may have the markings to prove so. It has been carefully cut, drilled, filed, formed and polished by myself. GRACE can be easy formed to your arm by carefully placing pressure on the metal. GRACE ships professionally tagged and boxed - perfect for gift-giving! If you have a family heirloom that you wish to be up-cycled, please convo me. I can work with your piece to create your own family treasures! Perfect for those occasion gifts that are truly unique and emotionally special. If you are looking to add unique, quality jewelry to your retail shop or gallery, OR need custom work, please contact me, I would be happy to discuss!! Orders placed up to and including Valentine’s Day (Feb 14) will be shipped with red ribbon unless otherwise requested. I originally purchased the earrings on 12/20/18 and never made it to me. The designer went the extra mile, made another pair of earrings just for me!! The earrings are unique, yet very feminine. I love them!! Love this bat! I am very pleased! TruForm is now set up to accept payment via PayPal, Credit Card and even ETSY Gift Cards! Payment via PayPal accepted. Product ships within 1 business day upon payment confirmation! Cancellations must be made within 24 hours of order placement. Custom order deposit payments will not be refunded if cancelled. Any return requests must be made directly. Due to hygienic reasons, all earring sales are final. Any return charges, damages, losses are the responsibility of the buyer. Refund will not be applied until product received and inspected. Like you, once I have placed an on-line order, nothing is worse than those days anxiously waiting for the package to arrive!! Fully understanding this feeling, your order will be shipped within 24 hours of payment receipt via 1st class mail unless otherwise arranged. Note: Shipping time will be arranged for any custom item requests. Once it has been dropped in the post, you will receive a shipment notice from me. If you require faster delivery, please let me know so we can adjust the shipping arrangements. Type. In Canada. To USA. Seller cannot be responsible for lost packages. Please be aware that purchaser is solely responsible for any fee's and taxes. All items are one-of-a-kind -- the photos you see are the pieces you get (no surprises!) As such, all pieces are copyright TruForm Jewelry Design. If you are looking to add unique, quality jewelry to your retail shop or gallery, OR need custom work - please contact me directly, I would be happy to discuss. If you have any questions, please let me know. I'd be more than happy to hear from you!! Please contact me to discuss your wholesale requirements and provide your business details (name, website, etc). I currently sell globally and would be delighted to provide unique, quality products to your retail shop or gallery! I love ❤️ to collaborate with customers to create personal, customized pieces! Whether you are looking for a unique item to be created for a special event, personalization with script or items carefully hand crafted from your family heirlooms, the sky is the limit. Please convo me to discuss and let's make something really special! Custom requests require a non-refundable deposit and cannot be cancelled or returned. Please confirm your ring size before placing order. Ready-made items ship within 1 business day, while made-to-order items ship within 3-5 business days. Custom Orders ship as discussed with purchaser (typically 1-2 weeks). All of TruForm’s orders ship in professionally stamped boxes with ribbon. Let me save you time and order gift-wrapping at time of purchase and I will do that for you. All you’ll need to get is the card!